The Pinky Winky hydrangea is not one you will easily forget. The flowers are pretty shades of pink and white and the shrub itself can be eight feet tall. Plant this one someplace where it has room to branch out. It is a paniculata and is a sister of sorts to the “Limelight” hydrangea which also has cone shaped flowers, but they turn a light green. Paniculatas are hardy and the flowers form on new wood – or new stems, and that means the pruning – if needed – should be done in late winter or very early Spring before the new buds set. 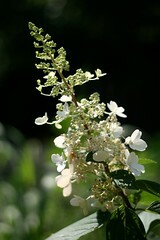 This shrub will bloom in summer and into Fall, like many hydrangea varieties. As you can see from the photo I’ve added (not mine), the blooms start off mostly white and fill out along the tall spire, shaped like a Christmas tree. Later the flowers will change color to pink. See a good picture of them at the Proven Winners site. Remember to plant this one in either sun or partial shade, but the ground should be moist and cool. That is what most hydrangeas seem to like. I look forward to growing my own this year, and then I’ll add my own photos.